Are you looking for tourist places in Port Blair? Port Blair is one of the most beautiful tourist attractions of the exotic Andaman Islands and also the headquarters of Andaman and Nicobar Administration. It is a Union Territory (UT) and all major departments of the UT Government and Central Government are functioning from Port Blair. Here are the important things to do in Port Blair. 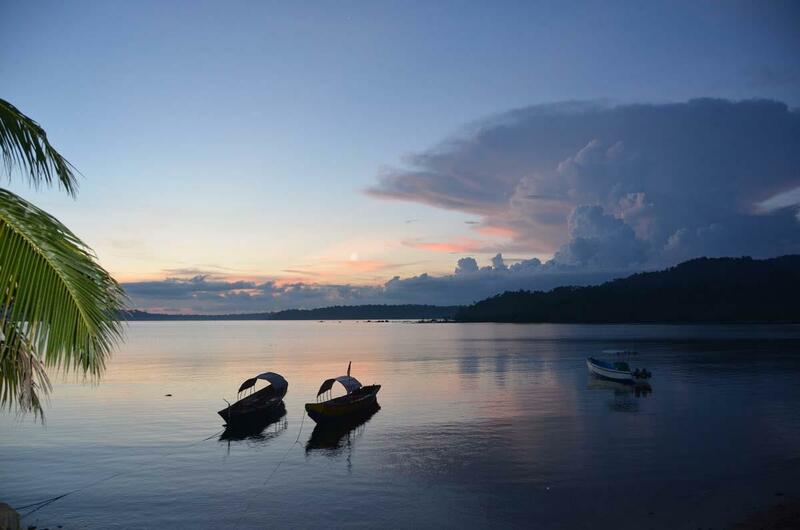 check out this Port Blair travel guide, and you can savour my awesome trip to Port Blair. Before I start describing my experience, here is a brief history about the Andaman Islands. The island's name has evolved from the character Hanuman of the Hindu mythology Ramayana. During the British regime the Governor General if India: Lord Cornwallis appointed Lt. Archibold Blair to survey the Andaman Sea in 1788. Post the 1857 mutiny Britishers decided to transfer revolutionaries to these remote islands. The city was named Port Blair in the 18th century to recognise the services of Capt. Archibold Blair. Just before the Second World War between 1942 to 1945, the islands were under Japanese rule. When the Japanese surrendered, the administration of these islands was again in the hands of the British. After the independence of India, the Britisher's rule ended. Read about important things to do in Port Blair in this travel guide. Port Blair named after Capt. Archibold Blair is the entry point for visiting the islands. It is the capital of Andaman and Nicobar Islands and located on the South Andaman Island. It is known for the clean and serene beauty and is also the largest city of the Union Territory. There are many popular tourist places in Port Blair. which is the first integrated tri-command of the armed forces of India namely: INS Jarawa of the Indian Navy, the sea base of Indian Coast Guard and air base of the Indian Air Force. Port Blair is connected to the mainland of India by air and sea. You can take a two-hour flight from Chennai, Kolkata, New Delhi, Bhubaneshwar or Vishakhapatnam and land in Veer Savarkar International airport on Port Blair. Or you can take a three-four days voyage from Chennai, Kolkata or Vishakapatnam and embark on Haddo Wharf. The city is reachable by bus, taxi or rented car. Luckily we had booked the hotel and car from Mumbai a week before the holiday. So when we landed at the airport, the car was waiting for us. It took about 30 minutes through the hills to reach the hotel which was booked for night stay. Next a little about how to manage the local travel! The town is easily accessible by public transport which is quite easy to avail. Apart from buses, the other modes of transportation like taxi and car. Once you have decided the itinerary of local attractions you can hire a cab or taxi for a day- full or half or for a fixed period of time from tourism operators. Take some time and enjoy all the attractions at a reasonable price. One of the most important tourist places in port Blair and located at Port Blair is the seafront Cellular Jail. The construction of this jail was completed in 1906 and was earmarked as British penal colony. The individual cells were constructed along the seven prongs extending from the centre and looking like the spokes of a wheel. Hence the name 'cellular'. In one prong, the last cell holds special significance because this is where Veer Savarkar was imprisoned in solitary confinement. The jail is open to public for specified time. You can walk along the prongs of the jail, and peep into the cells. The centre of the jail is a small watch tower and you can climb three floors and reach the top where you can see the sea around you. The cells were arranged in such a way that cells on the adjacent prongs did not face each other. So often the prisoners could not see each other for days on end unless they were brought on the grounds. There was no escape from the cells. Each cell had a small peephole to provide food and the prisoners could just the opposite prong walls for months and years on end. Many prisoners starved, fell sick, were depressed and even died. In one corner of the jail is a hanging room where prisoners were hung till dead. A visit to the jail will sure raise your goosebumps when you hear about the tragedies and the sufferings of the prisoners. 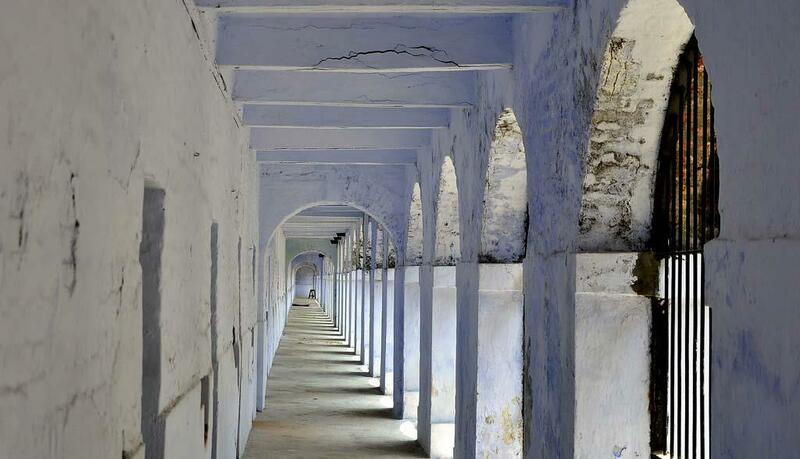 The Cellular Jail was declared as a 'National Memorial' and is a pilgrimage destination for the freedom lovers. Today this memorial stands witness to the pain, cruelty, distress and anguish forced on the freedom fighters, who were confined in this Jail. The jail also houses a museum, art gallery and a photo gallery depicting the history of the islands. It includes memories of when the British landed in the islands, the construction of the Jail, the life in the British colony, the life in the jail till the British left the islands and post-independence events. The tour in the jail takes more than an hour depending on the time you spend in the museum and the gallery. The Jail authorities organise the light and sound show after sunset where the freedom struggles are brought alive. The show is organised every evening in the jail premises with the show in Hindi and English. You can relive the memories of the happenings in the jail prior to independence. The tickets are reasonable and the visit to the jail and the light and sound show is worth a visit at least once in a lifetime. I have visited the jail twice and both times the saga was etched in my heart and soul forever. It showcases the marine life of the islands which is specifically found in the Indo-Pacific Ocean and the Bay of Bengal. The museum exhibits about 350 species of marine life like corals, sharks, starfish etc. If you haven't been for snorkelling or scuba diving, then this museum will be worth a visit. Children, the young and the old all will enjoy the displays in the museum. Anthropological Museum is another tourist places in port Blair. Wouldn't you like to know about the indigenous tribes of the islands and their lifestyle? This museum exhibits the people and their daily use artefacts like boats, vessels, clothing, baskets, weapons etc. and the records of the explorations which have been undertaken after independence. A visit to this museum will take you back in time into the most traditional life on the earth. This is the biggest and the oldest sawmill in Asia which is built on a small island away from Port Blair. In olden days logs from the forests of Padauk, Gaurjan,Marble, Satinwood etc. was sawed here. But now logging is banned by the government and hence the mills saws wood imported from south Eastern countries like Malaysia, Myanmar and Thailand. The zoo is a must and an enjoyable trip for the children. They can watch the rare species of animals like the deer, wild boars, wild pigs, monkeys etc. and the birds found on the islands. Also called Samudrika and is run by the Indian Navy and displays the history, shells and corals geography and the archaeology of the islands. one of the most beautiful parks in the city which offers amusement rides, water sports, nature and walking the trail around the lake, historic remains of the Japanese temple and a bunker. The Dilthman tank which was the only tank supplying drinking water to the city in the past has now been converted into a park. This is another famous tourist places in port Blair which is located near the water sports complex and offers amusement rides for the young and the old. The rides include paratrooper, dragon coaster, giant wheel. You can also visit the botanical garden and see the statue of Netaji Subhash Chandra Bose here. Science Centre is a famous tourist attraction Located at Goodwill Estate and like any Science Center you can check out more about the islands, science of the oceans, science gallery, quiz corner etc. Drive or take a bus for about 7 km from the city and visit this beautiful coconut palm fringed beach. Enjoy the water, or boating or just relax under the palms. A must visit if you are in Port Blair. The beach has basic facilities like the hotels, restaurants, changing rooms etc. While on the way to the cove does not miss taking a look at the historical remains of the Japanese bunkers. In Hindi, it means an island and is located at the southernmost tip of South Andaman. This attraction is a favourite destination for bird lovers and bird watchers. The island comprises of green mangroves, lush forests and a large number of chirping birds and Sylvan sands. You can enjoy a day picnic at this place. Near this place is Munda Pahada, a beach favourited by the locals. On the top of the hill is a forest guest house which provides a breathtaking a view of the islands and sunset. If you are looking out for one of the highest points in the islands then check out mount Harriet. Located at 365 m above sea level it was the summer headquarters of the British commissioner before independence. You can trek up to Kala Patthar hilltop which has a forest guest house with lovely huts and of course a wonderful view, thus making it an apt place for photography. Did you know that during the British Raj this island was the capital of Port Blair and standing guard to the harbour. Currently, the island buildings like the Ballroom, Church, Bakery, Hospital, Government House, Chief Commissioner's House, Cemetry, troop Barracks, Swimming pool are in ruins. A visit to this island will give an idea of the glory of the British and you will be able to understand and feel the apathy faced by our freedom fighters during the British rule. After the day trips to various locations, one more item on the itinerary should be a picturesque harbour cruise. Enjoy the panoramic views of various islands and the harbour. as the name suggests this island was infested with vipers and was reachable for convicts if they dare escape from the Cellular Jail but they never survived the vipers. Step onto the island and you will get an eerie feeling! The island is serene and beautiful, but will make you visualise the tragic past of the runaway convicts. but a little further away from city constitute a day trip. More about these attractions in another article since they are lengthy and mesmerising too! We surfed the web and located several tourist operators, hotels, resorts on the Andaman And Nicobar Islands Government's official Tourism website. After a detailed survey and enquiry we chose Palm Grove Eco Resort, an award winner on World Tourism day 2002 for promoting eco Tourism in the Islands. The eco-friendly concepts are applied to the entire resort including rooms, décor, ambience, dining and upkeep of environment. Across the city you will ample places to eat which provide a variety of cuisines Indian, South Indian, Bengali, Chinese, Asian etc. Do not miss to check out Lighthouse if you are a non-vegetarian and Annapurna if a veggie. Visit the most reliable and reasonable emporiums owned by Government called Sagarika. You will find spices, clothing, jewellery, pearls, stones, all types of locally handcrafted souvenirs suitable for all ages. A few photos depict the lovely shell earrings, which memory of the islands. 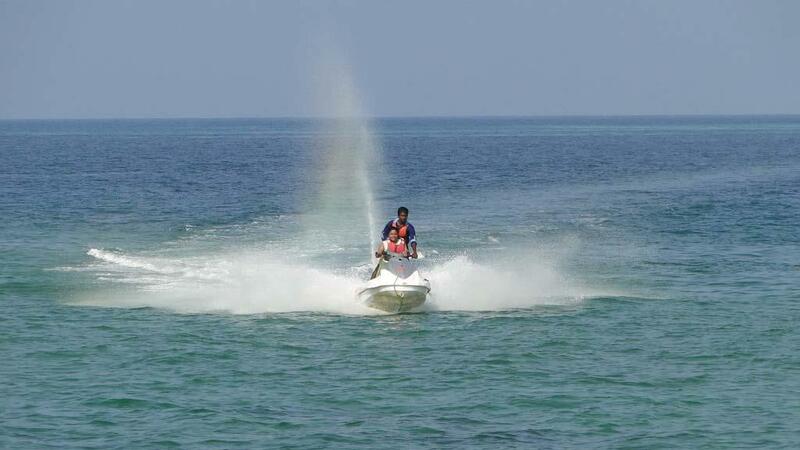 There are many things to do in Port Blair. A holiday in Andamans is not complete without some adventure sports like snorkelling, scuba diving, fishing, surfing, island camping, water sports, trekking, hiking etc. Enjoy the sports in various locations, since at each place the view and marine life will be different. 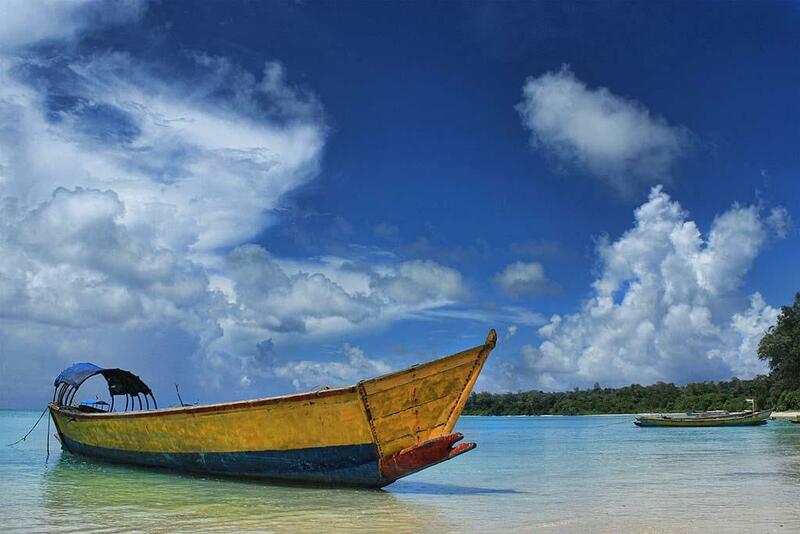 To sum up, Port Blair is an exotic location in the Andaman Islands and will make you cherish these memories forever. Cellular Jail is a must visit place in Port Blair. Evening light and sound is really amazing. I made a visit to Cellular Jail when I was in Andaman and Nicobar Islands, and it was an awesome experience.